White peonies are stunningly beautiful flowers to paint in watercolor. I have a beautiful white peony from my husband's grandmother. I know the original plant was at least 50 years old, so it's quite ancient for a ordinary garden flower (not for a peony, though!). When she moved, we divided the peony 3 ways. It was large enough (and I was scared enough of losing a family heirloom) I divided it 4 more ways and planted it in my yard. It was a very large peony. I was so relieved when it survived the winter and bloomed that spring. Now I have 2 peonies larger than the original and 2 not far behind so unless it rains as the buds open, I always have white peonies in my garden for a month! Every summer since, I paint the white peonies in my garden. Sometimes it's a little sketch and sometimes full paintings. This is the first video painting tutorial I've done of them, but probably not the last! Here's a quick photo painting tutorial. White flowers are just gorgeous challenges to paint in watercolor. When they work right, watercolor is the only possible medium for painting white flowers in. When they are wrong, they can go so very wrong! They require both boldness and a delicate finishing touch. It's a tricky combination! But when white flowers work, there is nothing more beautiful. Oil paint can't capture the elusive translucency. It may be easier to paint white flowers in oil, but they are always a bit heavy compared to the glow of watercolor. Here's how this white peony was painted! I begin by negative painting around the white peony. I want a slightly pastel background so I'm using cobalt blue and ultramarine blue. I don't want the gaura in the background to distract, so I'm using some quinacridone red to tone it down to a pink. I have my soft background painted, blurred and out of focus. I want the leaves a little sharper but still reflecting white. I'm ourlining the flower quite harshly as I paint the background. I plan on blurring it later so the focus is on my center of interest. I paint a very light wash of yellow into the flower petals and let it dry completely. Then I go back with cobalt dulled with a little quinacridone red. (Yes, I know, weird for me to premix! Guidelines are meant to be broken!) The peony needs to glow against the deep shadows on it so I need a dull, cool shadow. I lightly hit the shadows around the peony flower, blurring as I go. I paint the petals very sofly in dulled blues. I use tinges of ultramarine blue and pthalo blue. I use a lot of water, letting the color float and blur softly at the stem side petal edges while having sharp edges on the outer petal edges. I want to keep the colors varied and softly lit. After this has dried, I paint bright azo yellow tinged with quinacridone gold at the center of the flower for that glow. I then let this dry completely. White flowers always involve a lot of layers and drying in between layers. That's why I rarely paint them on location. It's much easier to paint 15 minutes, then let it dry 15 minutes in my studio! Here's the fun part! I continue letting colors blur in and out of each other. 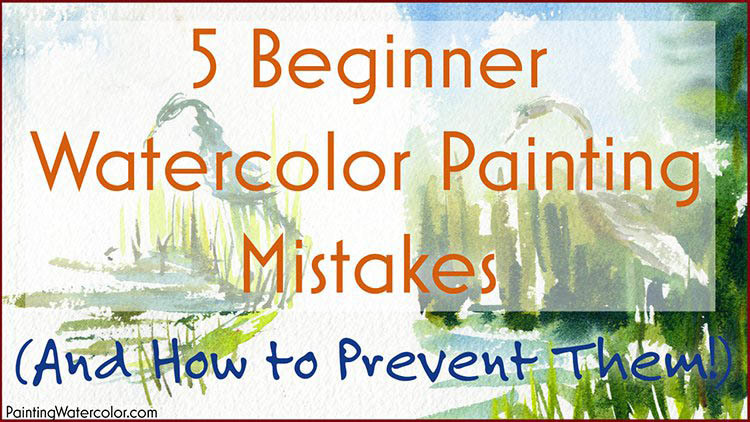 The trick to doing this without a muddy mess is to keep a limited palette in any 1 wash. I'm getting the lovely glowing effect, but the pastel background just makes the whole thing look wishy-washy. To give a bit of boldness I go in the background again and darken the wash. Notice how the dark background turns the flower from a bit insipid and dull to a glowing flower. I carefully paint the flower bud, pthalo green, azo yellow and a few drops of quinacridone red. I don't touch it again! Fussing would mess it up. I like the darker background so much I darken the rest of it! 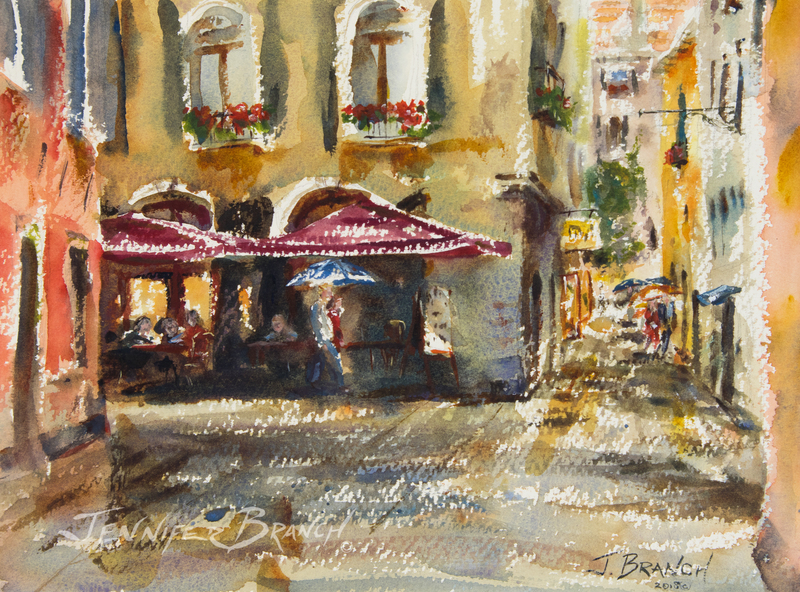 Always adapt watercolor paintings as you paint them and NEVER paint your darkest dark until the end of your painting. A little bit of splatter paint livens up the painting a bit. I paint a few darks and blur the gaura a little. I'm blurring a few edges with a clean wet rag in this stage. I love the softness that gives to flower petals. My final step is to paint the bright red petals near the center of the peony. I use quinacridone red, then drop in a touch of maroon perylene. I blur or sharpen a few areas, concentrating on the center of interest. Just a few details at the center sharpens my focus nicely. I will probably paint a white peony every year they bloom. 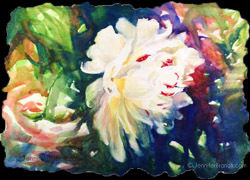 Considering how long peonies bloom, I should have quite a few paintings of them! There's always something a little magical about peonies. And some years it rains or they simply don't bloom well for one reason or another. I have a few pink peonies that remind me of cotton candy, but the white peonies with the dashes of red steal my heart. I strongly recommend painting white flowers. They are more interesting the more you paint them! (And possibly a little more difficult the more you know...) White flowers are one of the best ways to sharpen your painting skills there are. Please instagram your white flower paintings (or other paintings inspired by my website) #paintingwatercolor ! I'd love to see what you paint next! On a side note, does anyone know what this variety of peony is? I'd love to know!